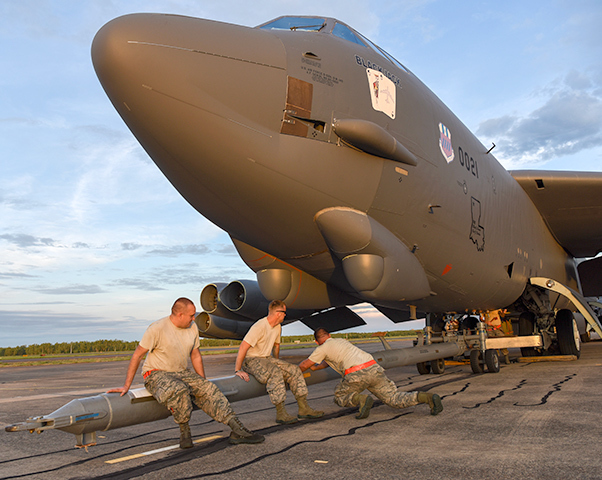 U.S. Air Force members from the 96th Expeditionary Aircraft Maintenance Unit shake a tow bar to maneuver it into place on a B-52 Stratofortress bomber during exercise Lightning Focus at Royal Australian Air Force (RAAF) Base Darwin, Australia, Nov. 29, 2018. Two bombers along with aircrew and support personnel deployed to RAAF Darwin to enable the U.S. to train and increase interoperability with Australian counterparts in support of U.S. Indo-Pacific Command’s Enhanced Air Cooperation (EAC) program. The EAC comprises a range of air exercises and training activities designed to enhance regional cooperation, coordination and interoperability between Australian and U.S. service members. U.S. Pacific Air Forces deployed aircrew, support Airmen and two B-52 Stratofortress bombers to Royal Australian Air Force Base Darwin to conduct combined exercises and training with their Australian counterparts Nov. 29 to Dec. 9, 2018. The deployment is part of the Enhanced Air Cooperation (EAC) under the Force Posture Initiative between the United States and Australia. 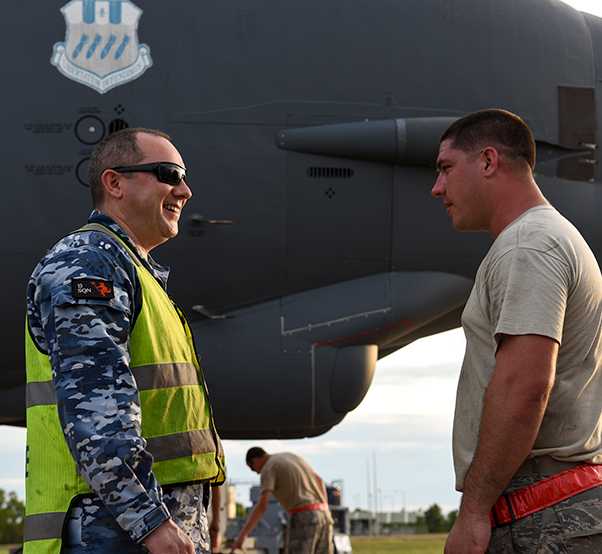 Royal Australian Air Force (RAAF) Leading Aircraftman Kevin Ewart, 13th Squadron aircraft refuler, and U.S. Air Force Staff. Sgt. Spencer Leger, 96th Expeditionary Aircraft Maintenance Unit crew chief, discuss refueling operations during exercise Lightning Focus at RAAF Base Darwin, Australia, Nov. 29, 2018. While at RAAF Base Darwin, the detachment, alongside their RAAF counterparts, will provide support to a wide range of exercises and training activities. Through this EAC initiative and the continued enhancement of the RAAF facilities, Pacific Air Forces and the RAAF continue to build upon their individual and combined capabilities, advancing interoperability between the nations. Other aircraft participating in the EAC event include RAAF F/A-18 Super Hornets. Enhancing the ability to conduct joint and combined missions from northern Australia is an integral part of the Force Posture Agreement and contributes greatly to regional security, stability and combined readiness. U.S. B-52s previously participated in an EAC event in April 2018 when they participated in a close air support (CAS) exercise with Australian Army and Royal Australian Air Force units. A B-52H Stratofortress bomber assigned to the 96th Expeditionary Bomb Squadron, deployed from Barksdale Air Force Base, La., sits on an apron after arriving to Royal Australian Air Force (RAAF) Base Darwin, Australia, Nov. 29, 2018.